It all started with money.....or better explained, money I refused to spend! Doesn't it always start that way??!! ...in Hobby Lobby and HomeGoods. 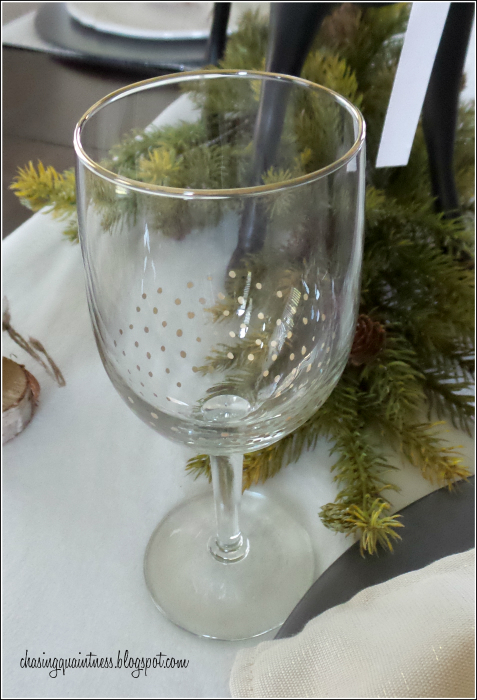 I fell in love with theses glasses; they would be perfect for my dining table over the holidays. Sadly, I walked away and did not buy them. You see, I'm cheap when it comes to things I'm only going to use for a short period of time and these were too pricey for short-term use. So, after mulling it over and checking around on Pinterest for some ideas, I decided to make my own. They even had a gold rim! I squealed when I saw them...yes, people stared...I didn't care. They were PERFECT! Only $1.00 each. I purchased 6! I tested my paint pen on a piece of cardboard to prime it and to see how much paint oozed out with each tap. Depending on how hard you press, you got a lot of paint...like a blob....or a little bit of paint...like a speck. I opted for a small amount of pressure. After washing and drying the glasses, the fun began. 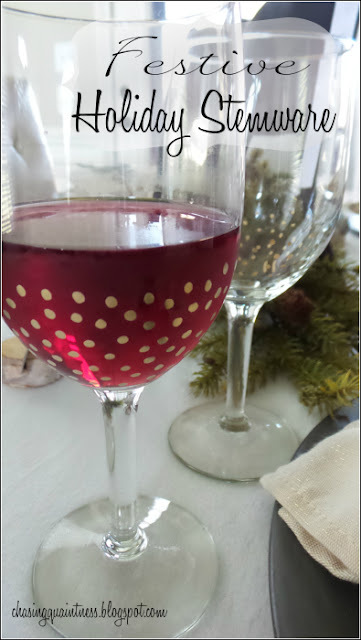 I started "polka-dotting" on each glass. It wasn't hard and there is no specific way to add your dots. If you want a pattern, paint them in a pattern. If you want willy-nilly, then paint them willy-nilly...that's what I did. A side note here....this process is addictive! I don't know if it was the head-dizzying paint fumes, the dazzling gold color of the paint mesmerizing me or the fact that it was super easy - could have been all three - but I was ready to "polka-dot" everything in my path. The hubster ran and refused to sit still...he was afraid he would be next! I loved doing this so much! I think they look adorable and add some festiveness to my dining table! 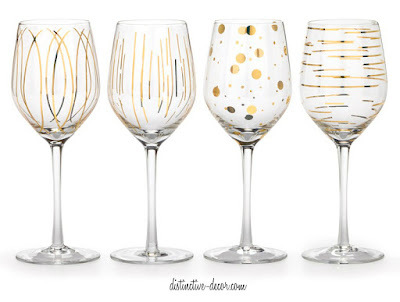 Yes, I know you've learned some new words here today, but more importantly, you have learned how to save a little money AND get that festive holiday stemware! When I get brave, I will give these a whirl! Now, where did I put those plates??! HA....not even close. I think I've just figured out my strengths and weaknesses....LOL Thank you! 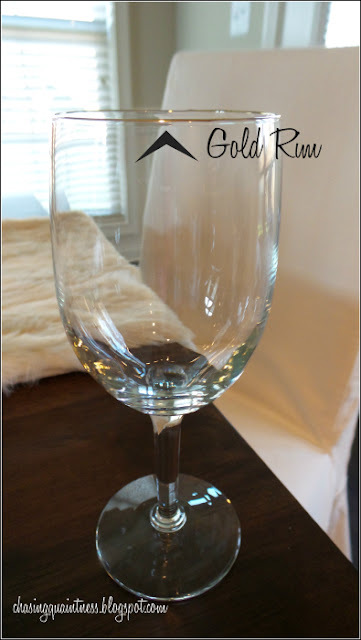 I enjoyed making these little glasses! I love these so much......I am going to make some right away. Now see what you started. Great job! Brilliant and creative- the polka-dot craze has begun! The ones you painted are better simply because you put your personal touch on them! So cute!! It can't be that easy! No "baking" to keep the color on?! Just dot and done? Thank you! It is that easy...dot and done. I don't think they would withstand the dishwasher, but they did withstand being gently washed by hand. It may be the type of paint pen that stays on. I do feel that they will wear off over time though. Thank you ma’am and you are welcome! I feel that blogs should be somewhat educational as well as entertaining! ;-) We should all know some new silly words! :-) Merry Christmas Carla!! This is insane!!! Thank you! I am always breaking wine glasses--I am so lazy and I put them in the dishwasher. So blonde of me, I know!! Honey, it just doesn’t get any easier and I have a bad habit of breaking the glasses also. The price was minimal and they are not high quality so I won’t feel guilty if one gets broken. :-) Don’t put them in the dishwasher though…I don’t know if the paint will stay on…but hey, if hey wash off, grab your little pen and do it over….it is fun and addictive…or maybe just addictive for me…LOL. Awesome!! I cannot wait to see them! YAY!! Hugs!! I agree with Kim, I always knew you were crafty! I love the Dollar Tree and I love these glasses...and I love them even more after you added the polka dots! They look elegant and the little peek at your table looks so pretty! Thank you so much! I love the Dollar Tree also...so many cute things to use in craft projects and just to sit around. I was thrilled when I saw that the glasses had the gold rim on them...just made my day...LOL. Thank you again so much! Hugs!! Thank you so much! It was something I knew I could handle...but I did have to practice first..LOL. I love the gold, but I think silver would be beautiful also! Hugs!! I think the Nancy Drew in me just solved the mystery of why you say you are not good at crafts! Collectively these pictures show most of the 10 suspects involved in this crafty crime … I can’t do anything with nails that long! I can’t type or text, can’t do up buttons or zippers much less work with fiddly little craft objects so you deserve double points for any craft success like these cute glasses! 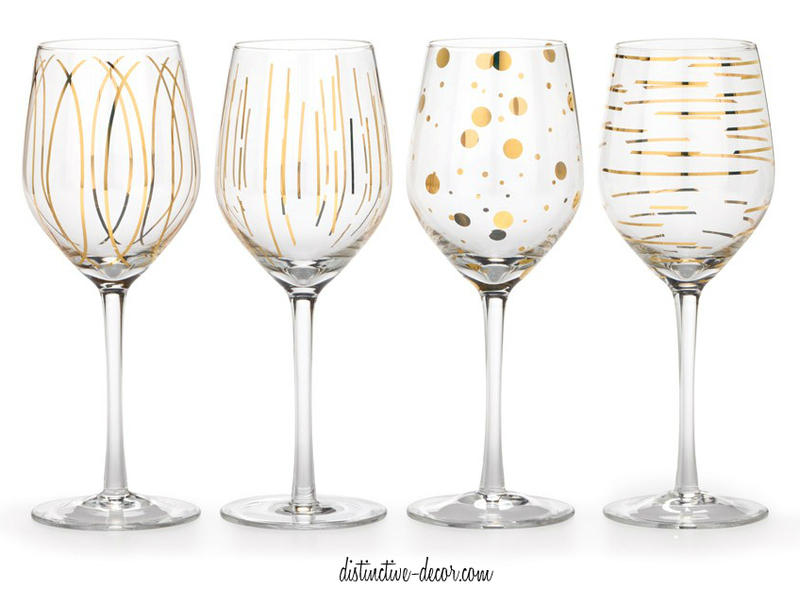 I love gold for holidays and have store bought stemware with gold swirls on them – but the idea of adding gold dots to everything now is very overpowering! I'm thinking my fridge could use a little festive gold sprucing up... someone hold me back haha! These glasses turned out great. 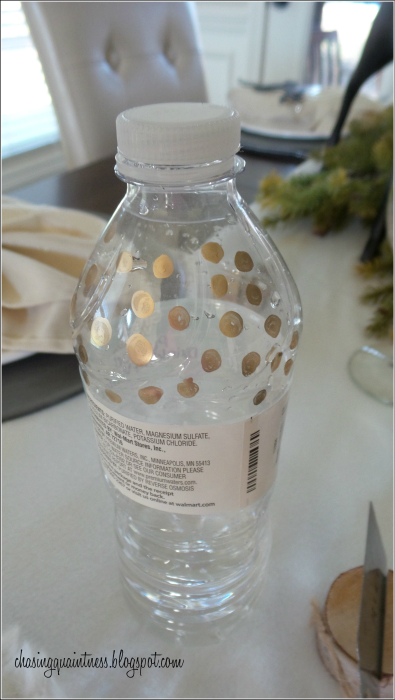 You are a pro at making consistent round polka dots.